Mar-Bal, Inc. Day of Action | Mar-Bal, Inc. The mission of WomenSafe is to provide emergency shelter and support services to survivors of domestic violence throughout northeast Ohio. Through our local United Way, our volunteers provided landscaping and lawn clean up services at the shelter. The volunteers included our President and CEO, Scott Balogh; our Vice-President of Sales and Marketing, Kevin Casey; our CFO, Jim Wojtila; our Engineering Manager – Sam Macio and other members of Mar-Bal from Operations, Human Resources, Engineering, IT, Sales and Marketing. As you can see from the attached pictures, we had a great team working hard to make a huge impact on this organization. 1 day, 15 volunteers, 20 yards of mulch, 7 flats of flowers. 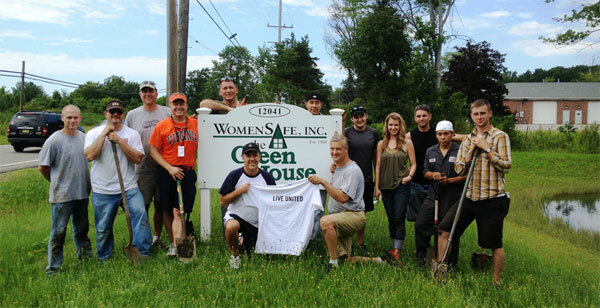 Reaction from WomenSafe and United Way … Priceless! It was truly a humbling and blessed opportunity. This entry was posted in News on July 12, 2013 by devore.